A DC Comics and Marvel Comics crossover. In this limited series (4 issues), two brothers, who personify the DC and Marvel Universes, become aware of the other's existence and challenge each other to a series of duels involving each universe's respective superheroes. The losing universe would cease to exist. The story had an "out of universe" component in that, although there were eleven primary battles, five outcomes were determined by fan vote. Aquaman (DC) vs. Namor (Marvel). Aquaman won by crushing Namor with his whale. Flash (DC) vs. Quicksilver (Marvel). Flash won due to his superior speed. Robin (DC) vs. Jubilee (Marvel). Robin won by using his cape as a decoy and then by tying up Jubilee. Silver Surfer (Marvel) vs. Green Lantern (DC). Silver Surfer won when both collided with each other and released a huge explosion which knocked out Green Lantern but Silver Surfer was unfazed. Batman (DC) vs. Captain America (Marvel). The match ends in uncertainty--though both are evenly matched after hours of combat, a sudden flushing of the sewer knocks Cap off balance. Batman rescues Cap from certain death via drowning, but concedes that he (Batman) lost in saving Cap. Storm (Marvel) vs. Wonder Woman (DC). After Diana drops Thor's hammer in order to allow the fight to happen as it was intended, Storm wins the battle after repeatedly hitting Diana with her lightning after a brief melee encounter. Superman (DC) vs. Hulk (Marvel). Superman wins with a one-punch knockout of Hulk. Marvel received more votes than DC, thus allowing Marvel characters to win three of the five fan voted battles. However, the storyline does not show one side as being victorious. As part of a last-ditch effort to save their worlds, The Spectre and the Living Tribunal were able to briefly force the "brothers" to resolve the situation by temporarily creating a new universe, called the Amalgam Universe, which is occupied by merged versions of many of the heroes (such as Dark Claw, a merging of the characters Batman and Wolverine). 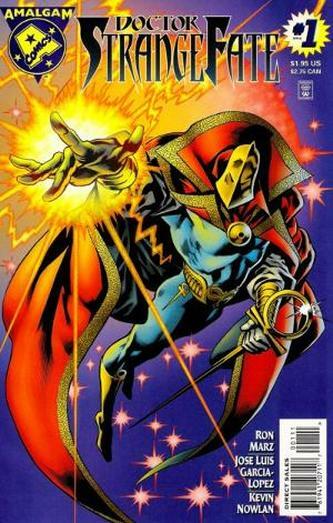 ​The trade paperback collects the 4-issue mini-series and Doctor Strangefate #1, due to its part in the overall story. Two versions of the paperback exist, with one edition having DC winning three of the five fan voted battles and another version of the trade paperback with Marvel winning three of the fan voted battles. In both editions only Superboy and Lobo lose their respective bouts.